Posts Tagged as "math meltdown"
This put a lot of pressure and stress on her mom, who was doing everything she could to try to help her daughter succeed at math, but she felt like she she was failing her daughter and being a “bad mother” because she couldn’t find a solution. The mom felt anxious picking her daughter up from school because she wasn’t sure whether or not her daughter would have a math temper tantrum. And even though when her daughter would express her feelings of math inadequacy, she was really just asking for help, it was so stressful for the mom that the mom sometimes would react with frustration just because she was so worn down from the seemingly endless math stress. I started working with this student towards the end of her fifth grade school year. 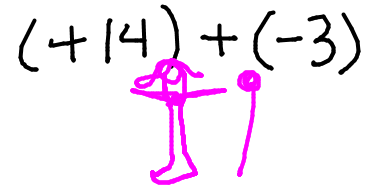 Because this student loves to dance and sing and has a great passion for musical theater, I started teaching her math songs to help her remember different concepts and formulas. We also really focused on filling in the gaps and building a strong foundation. Midway through the summer, this student started spontaneously singing her math problems! 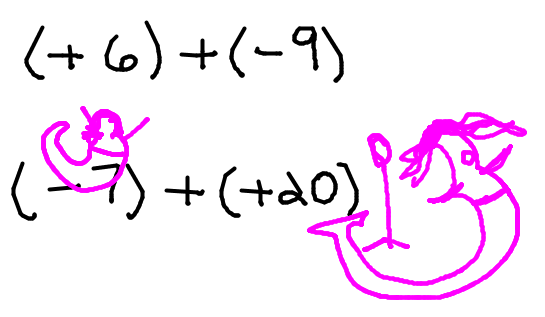 She would make up these little operas about all the different math operations she was doing – as well as songs just about math concepts in general, with sophisticated lyrics that showed she really got the concepts. She would even come to some of her sessions wearing her purple tutu. I was overjoyed to see her expressing herself so confidently and creatively with math, even with her outfits. At the same time, her mom and I also weren’t yet sure how this would transfer to the classroom. Her first day back at school, her first middle school math class of 6th grade, the teacher asked a question, and my student just couldn’t help herself – she shouted out, “It’s because of the commutative property!” It turned out that no one else in her class – even the students she thought of as being very strong mathematicians – had even heard of the commutative property before! This was a huge boost to my student’s confidence and enjoyment! Since her first day back at school as a sixth grader, she has consistently made 90s or 100s on every single math test and quiz she’s taken – except for one! On this test, she got an 88%, and what is so interesting is that this absolutely didn’t defeat her. Just as important, the mom’s experience has shifted dramatically now that she isn’t the one who is helping her daughter with math. She shared with me that when she comes home from work, it’s easy for her energy to be fully engaged with her daughter because it isn’t sapped by worrying about helping her with her math homework right away. She can just decompress and regroup and be energized and be a good parent. And her daughter has become so much more independent that the mom can be reading a book in another room while her daughter is doing her homework on her own! 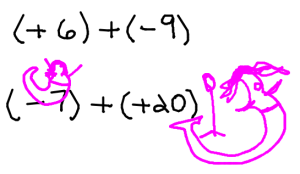 How did we create this totally awesome math transformation? Let me tell you all about it! 1. Positive, relaxed environment. We fostered an environment of trust and camaraderie. Our work together is committed and also relaxed; this student is totally free to make mistakes, ask questions, or go over whatever it is she needs to go over, no matter what. 2. Dealing with math feelings. When this student is overjoyed, anxious, or heartbroken, we deal with it together head-on. There was one session very early on where she (quite understandably) cried because she was so disappointed and frustrated with a recent grade. Instead of squelching this or ending the session, we just talked it out, making a safe space for her to feel, express, and release her frustration and disappointment. Other times she was so happy with what she was learning and accomplishing that she would dance and sing with glee and pride! 3. Consciously fostering a “growth mindset” with math. This student has an awesome “growth mindset” when it comes to her work in musical theater. She will audition over and over again for the same Broadway show, and instead of getting discouraged if she hasn’t gotten a part yet, she is just really excited about the process and the experience. At the same time, there have been periods where she has really expressed more of a “fixed mindset” about math – “you have it or you don’t,” and being worried that she wasn’t one of the ones who “had it.” We deliberately take time to talk about this together and draw parallels with her work in the theater so that she can pull that already-existing growth mindset into her math. We discussed at length how it’s like if she went to an audition and they asked her to play the bagpipes and do a Scottish accent, she wouldn’t beat herself up for not already knowing how to do those things – after the audition, she would just ask her teachers and coaches to help her learn, if that’s something she was interested in being able to do. Then she shared her philosophy of auditioning, which is that “it’s not just about the part, it’s about the experience, and if you’re not focused on the part, it will just naturally happen.” We drew direct parallels with what she tells herself during her auditions and what she can tell herself during her math tests. 4. Self-expression. 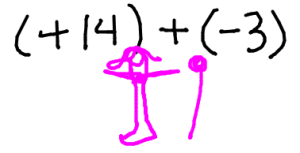 In the context of a supportive environment of trust where all of our work is super individualized, this student started to express herself more and more, whether it was singing the math songs she’d learned, making up her own original math songs, singing herself through the math problem she was working on, wearing her purple tutu, or decorating her problems with hot pink drawings (some of which are included in this very blog post)! Seeing her experience math as a vehicle of self-expression is absolutely encouraged, because it’s a huge sign that the student is getting way more comfortable and also really internalizing the material at a deeper level. 5. Support is normalized. Just like this student didn’t stop taking voice lessons or going to dance class once she started getting parts in musicals, math support that fosters her autonomy is now just part of her normal routine. Instead of saying, “Well, now her grades are higher, she’s done with math mentoring,” this student and her parents have recommitted to receiving support so that she can just continue to grow her math abilities and confidence more and more, and that her family can experience an even deeper experience of harmony around math. I am so, so proud of this student, and how her persistence, vulnerability, and commitment has created such true mastery, confidence, and JOY with her math! Are you tired of feeling like a bad parent because even though you’re doing everything you can to help your kid with math, it isn’t working? Does it break your heart to see your own purple-tutu-wearing kid have meltdowns about math? Are you ready to invest in high-level support? Just click here to get started with your special application for my one-on-one math tutoring programs. Once your application is received, we’ll set up a special phone call to get clear if my approach would be a good fit for your child. Parents routinely come to me with this situation. Your passionate, creative, unique, visionary kid has been struggling with math for months (or even years), even though they’re already giving it everything they’ve got. You’re spending hours on Khan Academy every night trying to untangle your kid’s homework, teaching yourself so you can teach them. Instead of having dinner as a family, you’re working on math. Your kid is so frustrated and stressed about math that they routinely break down and cry. Or maybe they’re just so anxious that you’re starting to pick up their anxiety yourself, and you’re struggling to filter everything you say, just to make sure you don’t snap at them. You feel drained, burdened, even resentful. You come home from work, and instead of being excited to see your kid and have this precious time with them, you are filled with dread about the math you’ll need to help them with tonight. Again. Night after night. No end in sight. And the days when they have tests are the worst. When you pick them up after school, you feel this knot in your stomach worrying about how they did. You’re already worrying about the doors that will be shut to them if they don’t feel comfortable with math. You don’t care whether or not they pursue math as a career – you just really, really don’t want their math phobia to get in the way of their dreams coming true. You might have even already taken then to a tutoring center and they hated it. Maybe they felt embarrassed that someone they knew might see them. Maybe they were just turned off by having to do worksheet after worksheet. And even though it was supposed to solve the problem, the tutoring center wasn’t able to help your kid either. And you’re starting to feel extremely guilty, because even though you’re trying everything you can humanly think of, your superhuman efforts are not creating results. Your kid isn’t really understanding, they’re not really learning, and they’re not getting good grades. Sometimes you feel like a failure as a parent. In a few years, your kid will be in college, out of the house forever, and right now, your precious time together as a family is being completely consumed by struggling with math. Does this sound familiar? Is this what you’re facing? Please know that you are not alone. Nothing is wrong with you. There is just something missing. You aren’t getting the support you need to truly understand, and neither is your kid, but that doesn’t mean that either of you is mathematically incapable. There’s just a gap between what you need and the resources that you have in front of you. Please know that what you’re facing is not insurmountable. Just because you have been struggling for months or years does not mean that you have to struggle forever. Now I’m on the other side, and I have helped many other families go from being completely consumed about math to feeling happy, relaxed, and confident about math – even in really extreme situations where a kid was so anxious about math they refused to do their homework unless they were sitting next to their mom, or, another example, where a previous tutor had told the family that math was like a foreign language and their daughter only spoke five words. Please know that you don’t have to stay stuck. It is completely possible to find support that results in lasting math transformation – even if you feel like you’ve already tried everything and nothing has worked. Please know that you don’t have to keep doing what you’re doing. If it’s not working, doing MORE of what’s not working is not going to create the transformation that you desire. Please know that you don’t have to do this by yourself. You do not have to reteach yourself all of the math you ever learned. You do not need to be the one trying to ensure that your kid understands. You do not need keep spending hours on Khan Academy every night trying to figure out what they heck your kid is supposed to do. You do not need to continue to feel this dread about your kid’s next math grade. If you’re ready to invest in world-class, one-on-one math mastery support for your passionate, creative kid, just click here to get started with your special application for my one-on-one math tutoring programs. Once your application is received, we’ll set up a special phone call to explore whether or not the magical way I work would be a good fit for you and your family! I can’t wait to connect and create this same lasting transformation for YOU! Does this sound familiar? Your kid is doing math that, if you needed to explain it to them, you would have a panic attack? mental meltdown? total and complete incomprehension? This is a situation that I face all the time. Sometimes a kid’s math will cross the “parental capability threshold” in elementary school. Sometimes it’s middle school. Sometimes, high school, or even college. But unless you, the parent, are actually a math professional or math educator, it’s very normal for there to come a point where you absolutely can no longer help your kid with math, no matter how much you WANT to help them with it, unless you take it upon yourself to teach yourself from scratch how to do it (and sometimes, not even then). Just because you are terrified doesn’t necessarily mean that your kid is terrified. Don’t assume you and your kid feel the same way about the math they’re being asked to do. Your kid is surrounded by other kids who are also doing terrifying math, and it might even feel normal to them. Maybe they feel proud or excited to be doing it! It is possible that they also feel terrified like you do. But just remember that it’s possible that you won’t be having the same emotional experience about it. Don’t underestimate your kid. (Especially based on your own math experience). Maybe you tried to do this level of math and failed. Or maybe even considering doing this level of math was so terrifying that you opted out, during your own education. Maybe you never had an opportunity to even TRY to learn this level of math. No judgement! However, keep in mind, your past math performance does not predict your kid’s future performance. Even though a lot of people in our culture talk about math ability like it’s a genetic trait, truly, truly, TRULY EVERYONE can learn to do math if it’s explained to them in a way that they can understand. Math is not a talent. It’s a skill that can be acquired with practice and persistent effort. Please remember this if you start to feel terrified about what your kid has taken on. You don’t have to be able to do the terrifying math yourself in order to be a good parent. It is normal as a parent to passionately want to give your own kid every possible opportunity to thrive. You want to teach them everything they need to know to succeed in the world on their own. How can you do this once the math they’re doing surpasses what you yourself have learned? Do not fear. You do not have to teach them terrifying math yourself! Sometimes the best thing you can do as a parent is make sure that someone else is helping your kid with the terrifying math for you, and just step back and focus on being a mom or dad, not on having to be a math teacher after you come home from a full day’s work. Are you ready to invest in having someone else – who is caring, empathic, adventurous, and super experienced – help your passionate, creative kid with the terrifying math, so you can just focus on being a parent? Just click here to get started with your special application for my one-on-one math tutoring programs. Once your application is received, we’ll set up a special phone call to explore whether or not my magical math tutoring programs would be a fit for you and your family! When this student first came to me as a 7th grader, she and her mom were experiencing math as a horrible struggle week to week. On her tests, she would initially get 40s, 50s, and 60s, and then spend a lot of time redoing the work over and over to pull up her grades, even more often than not staying in from lunch and recess to redo her work. So she was ending up with Bs and low As after all the do-overs, but as the result of agonizing effort. On many nights they would spend hours on her math homework, only to have the student end up in tears. And even this massive effort wasn’t resulting in confidence or mastery. On top of that, the student’s experience of one-on-one help from her mom had become highly fraught and the stress was affecting the dynamic of their mother/daughter relationship. The mom was really concerned that this student’s math struggles were going to keep her back from other academic and creative opportunities. This student is highly creative, unique, and passionate – she loves to draw, plays the violin, has her own sense of style, is a gamer, and even has been on multiple botball robotics teams. And the mom was worried that doors would be closed to her if math continued to be a struggle. This frustrating experience felt like a roller coaster, where the otherwise academically-successful student was starting to feel like an impostor after the erosion of confidence that happened from week to week of working so hard and not experiencing confidence, mastery, or good grades. We created a safe environment of total trust and camaraderie. We operated in a space that was a “no-judgement zone” where this student could go over whatever questions she had, however she needed to go over them, and with as much practice or examples as necessary. We also kept the emotional tone lighthearted and fun, even though the material was very challenging. We found the gaps and filled them in. By the time this student came to me, she had been struggling with math through 4th, 5th, 6th, and most of 7th grade – almost four years, with different gaps from each year. While working on whatever she needed to learn that day or that week, we excavated the layers of underlying math foundation until we found the initial source of misunderstanding. Then we would master that concept and gradually build back up layer by layer to the current material. This created a pattern of understanding, confidence, and success. Would you like your creative, unique, passionate child to have this same experience of being completely supported in experiencing math mastery? This application process has been meticulously designed to help us both get clear about whether the special, magical way I work is a match for you. Once your application is received, we’ll set up a special phone call to explore whether or not my magical math tutoring programs would be a fit for your family! I’m excited to connect with you! 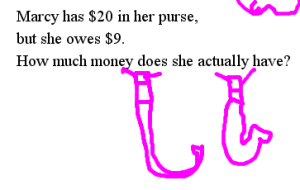 Case Study: a 7th grader goes from “I don’t get it” to getting 100 percents!